Horseshoes protect a horse's hooves from wear on hard or rough surfaces. They are also designed to improve a horse's gait, to help its conformation (how the horse stands), and to control interference problems (when hooves or legs collide with each other). For instance, for a condition called winging in—where hoof flight is to the inside of the stride—can be corrected by a square-toe shoe. A horseshoe is a U-shaped metal plate, usually made of steel though aluminum is also used. Aluminum shoes are more expensive than steel. There are also plastic-coated metal shoes, and even all-plastic horseshoes. Two-piece shoes are made of steel with a removable plastic insert. The all-purpose steel shoe used for pleasure riding is known as a keg shoe, since they used to come in a wooden keg. The shoes can be attached with nails since the hoof is very dense and contains no nerves. The cost to shoe a horse ranges from $80-$280, depending on the type of shoe and material. There are about 15 other types of horseshoes, depending on the breed of the horse and its function. Some breeds use different shoes on the front hooves than on the back. Some shoes come with a traction device so the horse can grip the ground better. Thoroughbred racehorses use what is known as a racing plate made from aluminum on the front. For the hind feet, an aluminum shoe known as a caulk or cauk is used that is embedded with steel to help improve abrasion and wear resistance. Some aluminum shoes are more squared off to resemble a hoof from a healthy wild horse. Standardbred racehorses use a lightweight steel shoe in front that is designed with a half round section or a grooved section called a swage. Sometimes a combination of these two is used. Steel is used in the back. Different shoes are used whether the horse is a trotter or pacer. Horses used for hunting or jumping use a shoe similar to the keg but a bit wider. Sometimes a traction device called a stud (like cleats) is used that is screwed into the shoe before the show. Draft horses use a thicker shoe since they are much heavier and larger than most other breeds. Saddlebreds, which have special gaits, use a toe weight shoe, which is 1 in (2.54 cm) wide in the front and 0.5 in (1.3 cm) wide elsewhere. The horse was a major means of transportation in the United States until the automobile was invented. The horse population declined from 1910-1960, as they were replaced with cars. However, in the early 1960s, the population increased as horse racing and riding became popular as a means of recreation. Over the last decade or so, the horse population has remained relatively stable. The decline in horse racing due to the replacement of other forms of gambling has been offset by the increased popularity of pleasure riding and horse shows. The process of forging and attaching horse-shoes became an important craft in medieval times, and played a major role in the development of metallurgy. Blacksmiths (iron was called black metal) made most of the iron objects used in everyday life though farriery, (farrier, which comes from the Latin word for iron, ferrum) or horseshoeing, was the most frequent occupation. A farrier's equipment consists of a furnace or forge, an anvil (a heavy block of steel or iron), tongs, and hammers. First, the sole and rim of the horse's hoof is cleaned and shaped with rasps and knives. The horseshoe is heated in a forge until it is soft enough to shape with the hammer to fit the hoof, cooled by quenching it in water, and attached to the hoof with nails. As machines took over the blacksmith's job, and horses disappeared from use in agriculture and transport, the need for farriery declined. Improvements in horseshoe design also have reduced the amount of forging work required by farriers. A low carbon mild steel designated A-36 is used for the most popular type of horseshoe. The steel comes in the form of round bars ranging from 0.5-0.7 in (1.27-1.8 cm) in diameter, depending on the type of shoe to be made. These bars are then cut to various lengths, again depending on the shoe type. Horseshoes are designed according to the breed of the horse, and will vary in size, shape and thickness. Since most are mass-produced, these designs are standard and are made using a two-part die that matches the dimensions and shape desired. A new die is only required if it wears out. In a few instances, custom-designed shoes are still made by hand at several companies. Some farriers also custom make horseshoes for lame or ill horses, which are typically shaped like a heart instead of a U. Forging, one of the oldest metal forming methods, is the primary process used for horseshoes. This process shapes metals by deforming them with a hammer, a press, or rollers. Smith forging consists of making a part by banging on the heated metal with a hammer. This is the familiar forging process performed by blacksmiths (farriers) on horseshoes. Hammer forging is simply a larger and more machine-produced version of the same thing. 1 The bar is cut to length according to the type of shoe using shear blades. The cutting equipment is operated either mechanically or manually by a foot pedal. After cutting, the bar is heated in an induction furnace or gas-fired forge to a temperature of around 2,300°F (1,260°C). The softened metal is then wrapped around a block of steel in the shape of the shoe using custom designed equipment. Another type of bending equipment uses a plunger in the shape of the shoe, which forces the bar into the desired shape. 2 Drop forging, the most common of the forging processes, is used for most horseshoes. 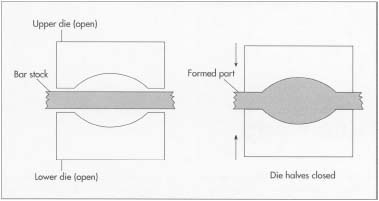 After the bar is bent, it is then forced into a die with the required dimensions by a powered hammer. One half of the die is attached to the hammer and the other half to the anvil. A cam mechanism determines the length of the stroke of the ram or how close the dies come together. 3 Once the shoe is bent, it is transferred to a punch press for making the nail holes. Usually eight holes are made per shoe. The punch tooling is custom designed for each type of shoe. Then a trim press is used to remove excess material, or flash. At this point, the shoe is still hot, around 1,900-2,000°F (1038-1093°C). After trimming, it is air cooled for 45-60 minutes. 4 After cooling, horseshoes are packaged by hand in 25 or 50 pound boxes. A 50-lb (23-kg) box typically holds 80 shoes. Some manufacturers package 15 or 30 pairs per box. Open die forging is the most common way of manufacturing horse-shoes. causes missing holes. During the trimming operation, the press is also monitored for cracks, which can cause burrs. The flash, or excess material, that is trimmed from the shoe is collected and sent back to a scrap yard for remelting and rerolling. Defective horseshoes are also reprocessed and reused. The steel shoe is expected to remain the most popular shoe over the long term. The basic manufacturing process therefore will not change much, though forging presses are becoming more automated, with programmable control of how much force is used and when. Horseshoe designs will continue to be modified to meet specific markets. The horse population is expected to remain relatively stable over the next few years, though certain parts of the United States will see declines. For instance, in states like New Jersey the price of real estate is becoming so high that one can no longer afford to buy enough land to keep horses. In Michigan, the horse population has declined by almost 20% from 1984 to 1997, as farm land is developed and casinos replace race tracks as the gambler's preference. Cain, Charlie. "Urban Sprawl and Demise of Racetracks Cuts Horse Population." Detroit News (September 30, 1997). "A Cobbler's Touch: Custom Horseshoes Help Lame, III Horses." The Dallas Morning News (February 11, 1999). Van Wyk, Anika. "Making the Shoe Fit/Modern Touches to an Old Trade." The Calgary Sun (2000). Equestrian Records and Curiosity. http://www.mrhorse.com/Recordsen.htm (21 February 2000). International Equine Resource Center. http://www.horseshoes.com (January 2001).